Shell Moerdijk maakt chemische producten op basis van aardolie. Het is een van de grootste chemische complexen van Nederland en Europa. 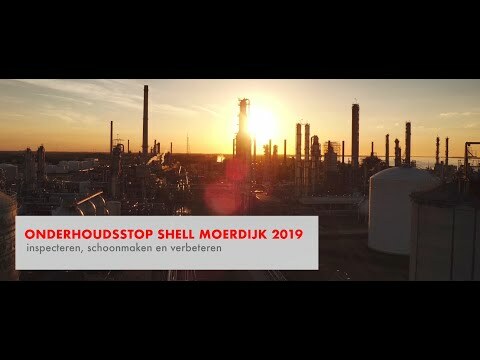 This video discusses the large-scale 2019 maintenance stop taking place at Shell Moerdijk. The plant is inspected, cleaned, and improved, while ensuring the safety of the many employees and contractors who are on the site. Upbeat and fast-paced instrumental music plays. Wide-angle aerial shot tracking upwards of Shell Moerdijk. The sun is rising on the horizon in the background leaving the plant at the front of the shot in shadow, and glinting off taller structures and frames. We cut to an aerial shot of the plant during the day, tracking to the left. A road runs up the left side of the shot. Cut to mid-shot of workers dressed in safety gear walking towards and then past the camera; some wear blue coveralls, others red coveralls, and still others black coveralls, and all have hardhats with safety goggles perched on top. A large orange site vehicle drives slowly behind these workers and to the right of frame, and we see metal structures in the background. A lot of preparation goes into a maintenance stop like this. Cut to a forward tracking mid-shot of the back of workers in safety gear walking away from the camera into the site. Scaffolding and plant equipment dominate the background. Cut to mid-shot of two workers, dressed in safety gear, standing on a section of scaffolding and passing a length of pipe across. Cut to a close-up of the chest of someone dressed in safety gear, writing on a piece of paper, while a colleague holds his thumb up to the camera; zoom out to mid-shot of three workers standing on site; behind them to the left is an office building and to the right is a large section of the plant with smaller office buildings in front of it. Workers walk purposefully in the background. Cut to mid-shot of Francis Schuurman. She is wearing red shell-branded coveralls, a yellow shell-branded hardhat, and red glasses. In the background is a blurred section of the plant. Cleaning them, repairing them, and replacing parts where necessary, because safety is the main goal. Cut to wide-angle shot of workers dressed in safety gear walking away from the camera, vertically across the shot from left to right. In the foreground is a metal structure horizontally across the shot, with an expanse of grass taking up most of the shot. In the background low metal barriers keep workers away from a low building with scaffolding against it, and a vehicle drives inside the enclosed area in the opposite direction to the flow of workers. Cut to medium shot of workers dressed in coveralls sitting at tables eating. Cut to medium shot of someone dressed in paint-splattered coveralls cleaning a part of the plant; he wears thick safety gloves, a hardhat, and ad face mask with air filter. On the left of shot we see another employee dressed similar cleaning another section of the plant. Cut to tracking mid-shot of employee dressed in safety gear walking away from the camera, carrying a length of pipe on his right shoulder. In the background we see a large metal structure, and pallets holding sheets of piping and materials in front of this. Cut to low angle long shot of an employee dressed in white safety coveralls and hardhat standing on top of a structure and spray-cleaning the floor. Cut back to Francis Schuurman. We have trained a lot of people who are going to work on this site in the coming months. Our prime concern is that at the end of the day everybody can go home safely. Backward tracking aerial shot of the plant. To the left we see the structure rising up to the sky, and in the middle there are some green areas and parking lots with a few cars dotted around. On the right are some buildings and smaller parts of the plant. The horizon in the distance shows greenery and the light blue sky is studded with flat white clouds. Cut to aerial shot of the plant tracking to the left. We see a portion of the metal structure showing various levels with stairs connecting them, and a group of workers in orange coveralls standing under one section of stairs. I am very proud that so many different groups work together here. We demonstrate real teamwork and show that we are stronger together. Cut to medium shot tracking to left of employee in red coveralls, white hardhat and safety glasses. He grabs hold of a section of chain that hangs down in the left of the frame and looks upwards out of frame. Cut to a low angle shot tracking to the left of a red site vehicle; an employee inside the vehicle looks up and to the left of frame. In the background the sky is blue with a light layer of white clouds. Cut to low angle shot of piece of equipment being lowered into frame. We see a section of the plant in the background and a white sky behind. Cut to mid-shot tracking right of three workers dressed in safety gear. The employee on the left looks into camera while his two colleagues study a drawing held by the employee standing in the middle. The inspiration comes from the people. They are extremely skilled and we are all on the same page. Cut to close-up of Henk Wapstra dressed in orange coveralls. He wears a yellow hardhat with safety goggles perched on top, and is wearing glasses. In the background we see the blurred outlines of the plant. Cut to wide angle tracking show moving forward of the plant. In the foreground is an expanse of water and in the background the blue sky is filled with white, puffy clouds. Cut to birds-eye-view of a section of road; three cyclists wearing orange safety gear cycle from top of frame towards the bottom of the frame and to the right a white van drives in the opposite direction. On the verge on the left is a neat stack of material, and on the right is a wide concrete path bordered by a section of grass. Cut to aerial shot tracking upwards showing the main office building in the front bordered by a small section of water and trees, and a parking lot filled with vehicles to the left. In the background the plant dominates the middle of the shot, and behind this is a wide section of water. Far off in the distance the horizon is green, topped by a blue-grey sky. Here we are at the Shell Moerdijk chemical complex. On average we have 900 Shell employees and 500 colleagues from contractors working here every day. Cut to medium shot tracking to the left of the blue Shell Chemie sign and yellow and red Shell logo on top of a low building; the sky is blue behind this. Cut to long-shot of an employee wearing red safety gear walking towards the camera. A high metal structure is to the left of shot, and a large orange container with the words “Coral Sticho” printed on it is to the right. Cut to medium shot tracking to the left of two workers wearing red safety gear and orange hardhats; we see the plant in the background, and to the left of frame a row of bicycles in front of a low prefabricated office. Cut to medium shot of two bespectacled workers looking into the camera; in the background we see the blurred outline of large metal structures. Cut to a medium shot of four workers standing in a group talking, with the plant behind them; they wear safety gear, hardhats, and ear defenders. In our plants we make base chemicals which you can find in the products that we use every day. Close-up of Richard Zwinkels wearing orange coveralls, a yellow Shell-branded hardhat, ear defenders, and spectacles. In the background is a blurred view of the plant. Cut to low angle medium shot of man smiling, wearing a pair of headphones, and looking at the screen of a cellular phone that he holds in both of his hands. Behind him to the left and right a grey building rises from the bottom of the shot to the top. Cut to close-up of a steering wheel with the Ferrari insignia; a hand steers the car and out the left window we can see a long building as the car drives past. Cut to medium shot of a woman pulling the bed covers up for a young child; the room is softly lit and a child’s drawings are stuck to the wall. Cut to a low angle long shot with the sun reflecting off the camera in the centre, grass at the front of the frame, trees to the left and right of frame, and a blue sky in the background. Someone runs across the frame from right to left. Cut to a close-up of a hand with long fingernails; another hand holds this hand and paints the nails carefully. Cut to aerial shot of the plant, tracking to the right. Cut to aerial shot of the plant, tracking to the left. Cut to medium shot of a section of the plant showing workers in safety gear standing on top of a high structure. Cut to a long shot tracking to the left of another section of the plant showing a section of piping rising up and across in the foreground and large white and metal dome-shaped structured in the background. Cut to Richard Zwinkels speaking to someone right of camera. In our plants we make base chemicals which you can find in the products that we use every day such as telephones, cars, mattresses, sneakers, and nail polish. With the maintenance stop on the 18th of April we will invest in our plants to guarantee safe and reliable operations in even more energy-efficient ways. Cut to high angle aerial shot tracking to the left of the plant. Cut to close-up of white and metal sections of piping with larger sections of the plant seen in the background as the camera tracks forwards. Cut to medium shot of workers dressed in safety gear in front of a blue metal container. Some are handling a metal tray with containers balanced on it. Close-up of two of these workers talking. Cut to low angle close-up of the same workers from the right showing the plant rising in the background. The employee at the front of shot points towards the top of the structure. Cut to medium shot of workers standing on site talking; the employee to the left of shot looks into camera and smiles, and then turns towards the back of the frame and looks at her colleagues. Cut to long shot of a large room filled with long tables and plastic chairs. Some workers sit at the tables eating, others move around the room. You can’t do a major stop like this on your own. At peak times we expect an additional 2,000 people on our site Together with these people we’re going to carry out around 750,000 hours of work. Cut to Henk Wapstra speaking to the left of camera. A lot of time has been spent onboarding these people and ensuring that they can work safely. That’s what it’s all about. Safety for the people, but also quality and timely delivery from the plants. Cut to medium shot tracking to the right of three workers wearing safety gear talking in a group; the plant is behind them. Two of them hold various pieces of equipment, and the other hands out folders with papers inside. Cut to low angle shot of an employee in safety gear on top of a structure moving a section of thin piping. Cut to low angle shot tracking to the left showing a large section of the plant with scaffolding and tall circular sections rising up in the distance. The mood in the teams is very good. The integration between Shell and its contractors, and amongst the contractors themselves, is the main goal now. Cut to medium shot of three workers dressed in safety gear standing on the site in group talking and smiling. Cut to medium shot of three workers dressed in safety gear looking into camera. Cut to medium shot of five workers standing in a circle talking; a large vehicle is to the right of frame and behind the group and a container is to the left at the back of the shot. Cut to Francis Schuurman talking to the right of camera. It is important that everyone has the same information to do their own job properly but also to be conscious of the other workers. Cut to forward tracking long shot of workers walking away from the camera; to the left stand other works in front of sections of materials, and to the right are neat stacks of scaffolding and materials. In the background we see containers and more workers moving around. Cut to medium shot tracking to the left of two workers sitting down and handling pieces of equipment; sections of scaffolding and the plant are in the background, and in the foreground. Close-up of a section of equipment being handled by two workers. Cut to upward tracking medium shot of section of the plant high up showing larger sections of the plant in the background. Recently we have moved from the preparation phase to the execution phase. We are ready to start on the 18th of April. We are on schedule with all the preparatory activities. Aerial shot tracking to the left of the plant; the sky in the background is grey-blue with smoke coming from tall sections of the structure and clouds further off in the background. Cut to low angle shot tracking to the left of metal sections of piping running from left of frame to right. Behind this we see tall circular sections of the plant rising up to the sky with a grey-white sky in the background. Cut to scenic shot at sunset of the plant on the horizon far off in the distance. Golden grasses move in the breeze at the very front of the shot, a large body of water fills the bottom section of the frame, and the sky is filled with clouds tinted by the sun setting to the right of frame. Cut to Richard Zwinkels speaking to the right of camera. During the stop we want to limit any disturbance to our surroundings as best we can. We do this, for instance, by using buses to reduce traffic on the access roads. Cut to close-up shot tracking to the right of a tinted car window which mirrors the plant behind the camera. Cut to low angle of the plant showing pipes crossing the frame from bottom right to top middle and white clouds above the taller sections of the structure. Cut to long shot of many workers dressed in safety gear walking towards the camera on a busy site. Metal barriers separate areas to ensure safety. Vehicles move slowly in the background, and another vehicle crosses from right of frame to left in front of all of these workers. Cut to medium shot tracking from left to right of a small piece of machinery on site with workers walking behind it. Cut to long shot tracking to left of another section of the plant. Scaffolding rises up on the right, in the middle we see large white circular parts of the plant, and to the left in the background is a taller grey building. Cut to medium shot tracking to the right of two workers in safety gear talking to each other; a trailer with materials is to the left of shot and the rest of the plant blurs behind this. Cut to low angle shot of a tall section of the plant; behind it the sky is grey-blue with white and grey clouds filtering the sun. Cut to aerial shot tracking to the right of the plant; large rust-coloured circular sections rise up in the foreground. Cut to aerial shot tracking backwards of the plant at sunset; the plant is in shadow, tinted red from the sun glinting in the background and the sky on the horizon is a soft orange with some thin white clouds scudding across the grey-blue sky above. As a single team we are ready to tackle the job in a safe way and get the plant ready to make all the products that we need on a daily basis. 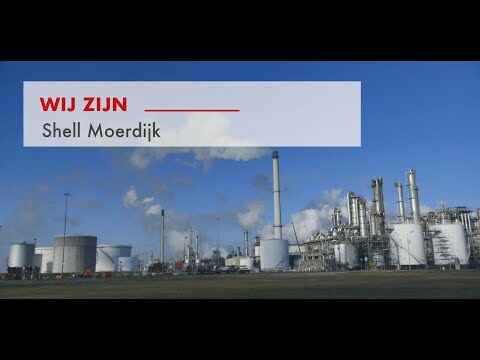 An introduction to Shell’s Moerdijk site where chemical products are manufactured from crude oil. A pipeline transports feedstock from the Pernis refinery to Moerdijk to manufacture everyday products. Safety is the top priority, but Moerdijk also plays an important role in the surrounding area, so good neighbourly relations are very important. Wide-angled view of the Moerdijk site set against blue sky as white smoke rises up out of the chimneys. Text appears onscreen top left as displayed below. Close-up of male Shell employee wearing a yellow helmet with Shell logo, industrial site in the background. Close-up of a smiling fireman standing beside a fire truck. Close-up of a female lab technician wearing protective glasses at an interior location. Close-up of a male Shell employee wearing a yellow helmet, protective goggles on top, at an industrial site. Close-up of a male Shell employee wearing protective glasses, arms crossed, at an interior location. We've been a major player in the petrochemical industry since 1968. We make chemical products derived from petroleum. Shot panning right to left passing by the Moerdijk site showing several buildings and chimneys. Shot panning right to left of a glass building, the Shell pecten logo and Shell Chemie in blue lettering at the top. Shot panning right to left of a row of chimneys at the site. Low-angled shot of part of the site, two yellow and black striped poles with a chain to the left restricting access as smoke blows up around the area. Our site extends to 360 hectares. The total area of the port and the industrial park covers 2,600 hectares. About half of this area is a green zone, which functions as a natural boundary between the plants and the surrounding towns. High-angled shot of the site showing various buildings and chimneys and a long pipe set against a clouded sky. Close-up of two male Shell employees wearing yellow helmets approaching. Shot panning right to left of the site, fenced off. Wide-angled shot of a field, the Moerdijk site in the distance. Shot panning right to left passing by the Moerdijk site showing the previously mentioned row of chimneys and other buildings, green grass in the foreground. Shot panning left to right of a residential area with green areas. At Shell Moerdijk, we have over 800 permanent employees and we generally have another 500 contractors working in our plants. Low-angled shot of an approaching Shell employee riding a bicycle under a network of pipes, then driving past the shot to the left. Shot of a Shell employee approaching from the right on a walkway, then stopping to inspect a valve. Wide-angled shot of the site as two employees walk past. Shot of cars parked to the left as a Shell employee drives past on a bicycle. To the right, a Caterpillar machine drives by. Behind it, a green van turning from the right comes into view. Most people work in and on the plant. In addition, we also have a logistics department, our own laboratory, our own fire brigade and a safety centre. Shot taken at an interior location of two men sat in office chairs, their backs to the camera, as they look at two rows of screens in front of them. Close-up of two Shell employees in yellow helmets inspecting equipment, then giving each other a thumbs up. Shot of a Shell employee wearing a yellow helmet and protective goggles approaching and then walking past the shot. Shot of a parked truck at the site as the driver walks around the back of the vehicle. Close-up of a lab technician’s hands covered in blue gloves handling lab equipment. Wide-angled shot of a road, the site in the background, zooming in slowly on a fire truck in the distance spraying water. Close-up of a framed document on a dark blue wall at an interior location with text about dangerous materials. We also have technical support from experts and engineers. All these employees are extremely important because their skills ensure a safe work and living environment, and put in motion our plans for the future. Shot focusing in on a Shell employee at an interior location wearing protective gear working on some equipment. Side-angled shot of a man at a desk laughing, then turning to look at a man sat beside him working on a laptop. Close-up of two rows of computer screens, then panning down to reveal a keyboard and a hand holding a mouse. Close-up of the aforementioned men at the desk talking. Shot of a female lab technician at work. Shot of a firehouse, its doors open, a fire truck inside as two firemen climb inside. Side-angled view of a residential area with houses on both sides, a water canal, trees and cyclists. Shot of a road as cars drive past. Wide-angled shot of the Moerdijk site taken from across the water at dusk, reeds in the foreground. In our plants, complex processes are used to produce base chemicals derived from petroleum. A major part of the raw materials are being supplied by underground pipelines from Shell Pernis. Wide-angled shot overlooking the site panning left to right showing a long pipe and several chimneys set against a clouded sky. Close-up of a gloved hand holding a glass bottle by a tap as a dark liquid pours into it. Close-up of a network of pipes. Close-up of several Shell employees inspecting equipment and pointing upwards. Shot panning left to right of a network of pipes. Wide-angled shot of the Pernis site. They get processed at the heart of Moerdijk, in the ethylene plant, also called the cracker. In this cracker, big molecules are cut into smaller molecules, and separated into different products. Side-angled view of two men at a desk, two rows of computer screens in front of them. Shot passing by the ethylene plant. Close-up of a computer screen, a man sat in front of it just to the left. Shot panning left to right of a row of chimneys. Animation of moving red, black and green molecules set against a light blue/green background. After that, the products obtained go to other plants in Moerdijk, are sent back to Pernis through pipelines, or go to other clients for further processing. Our plants mainly produce base chemicals. Wide-angled shots panning right to left of the site set against a blue sky with white clouds. Shot of a Shell employee approaching on a bicycle, then driving past the shot. Back to the shot of the aforementioned parked truck now driving off. Shot panning left to right of the site, smoke bellowing up. The end uses are quite diverse and include products from everyday life, like lightweight materials and car tires, cell phone covers, detergents, thermal insulation materials, gasket materials, but also products for personal and medical care. Close-up of refrigerated shelves stacked with yoghurt, cheese and other foods. Close-up of a hand picking up a pot of yoghurt. Shot of a three-lane road as cars drive by. Shot of a girl looking at her phone as she waits on a station platform, a train approaching and driving past. Close-up of a man putting insulation on a pipe. Shot of bathroom sink to the left as a lady holds her hand under a soap dispenser, then turns to open the tap and washes her hands. Our total production capacity amounts to more than four million tons annually. 70% of all the raw materials and products are transported by pipeline, 25% by ship, and the remaining 5% leave by train and road transport. The latter may seem small but it still represents 3,000 rail wagons and 7,000 tankers. Shot panning right to left driving past large white storage tanks. Shot of a group of workers at an exterior location. Close-up of a male Shell employee in yellow helmet looking down at something. Wide-angled shot panning across the site. Shot passing by several pipelines. Shot of a ship at the docks. Shot of a boat. Shot panning right to left of a cargo train. Shot of a truck driving on a road. Shot of several train tanker wagons parked at the site. Shot of several trucks parked at the site. Our motto is, "Work safely or don't work here at all." Because we work with volatile, flammable, and environmentally damaging substances, safety is our highest priority. The most important objective is to gradually reduce all risks. Shot of two Shell employees approaching from the left at the site. Shot of safety signs and safety information posted at the site. Shot of a Shell employee at an interior location putting on protective glasses and gloves. Shot of a fireman talking and pointing from inside a fire truck. Low-angled view of the fire truck driving past the shot. We safeguard our lives by having installations with great design and proper construction, maintenance, education, training, and raising awareness for accountability. This is how we ensure everyone's safety and wellbeing, in and around the site. Sequence of shots passing by the site showcasing the different buildings, chimneys and other installations. Close-up of two Shell employees in yellow helmets talking beside a network of pipes. Close-up of a signpost at a building, the pecten logo at the top, white text on a blue background reading Shell Chemie Moerdijk Safety Centre. Close-up of the side of a man’s face as he looks at computer screens, then speaks into a radio. Shot of two Shell employees in protective gear walking at the site. Shot of a Shell employee walking past a parked truck with a bicycle, then proceeds to get on the bicycle and drives off. Wide-angled view of the aforementioned Shell Chemie glass building and parking lot. Shell Moerdijk plays an important role in our immediate surroundings. Therefore, getting along with neighbours is crucial. As a neighbour, we stay in close contact with the area. Together with surrounding towns, companies, and residents, we discuss current topics. In addition, we keep in touch with schools and make donations to local initiatives. Close-up of a signpost, white lettering on a blue background reading Moerdijk gem. Moerdijk. Shot of a footpath and trees, residential homes in the background. Shot of a waterway with several boats to both sides. Shot of a road in a residential area, a signpost to the left, white lettering on a blue background reading Strijensas gem. Strijen. Shot of a lady walking a dog in a residential area. Shot of a road, a row of trees and bicycle lane with cyclists driving past, a signpost to the right, white lettering on a blue background reading Klundert gem Moerdijk Welkom! Shot of several homes and trees, a green field, wind turbines in the background. Shot of several homes by a waterway, two boats on the water. Shot of a lady walking a dog. Scenic shot of rocks rising up out of the water at dusk. Of course, many people find employment here as well - our activities generate work for many suppliers. Close-up of a pair of gloved hands turning a dial on some equipment. Close-up of a male Shell employee wearing protective glasses at an interior location looking left, then right. Close-up of a group of Shell employees wearing yellow helmets and protective glasses, talking at an exterior location. Investing in solar energy fits Shell's ambition to play an active role in the Dutch energy transition. Reducing CO2 emissions is essential to this endeavour - on the one hand, by improving the energy efficiency of our procedures, and on the other hand, by investing in new energy activities. Time-lapse footage of a blue sky with clouds passing over a bright sun. Shot of an electricity pylon. Back to the shot of the row of chimneys at the Moerdijk site. Shot panning right to left of the site with a long pipe running past. Side-angled shot of a man at a desk looking at two rows of computer screens. Close-up of the computer screens, the back of the man’s head to the left. Wide-angled shot of an empty field, the Moerdijk site in the distance. This is why we're building a solar park with over 75,000 solar panels which will generate 27 megawatts each year - the equivalent to the annual power usage of 9,000 Dutch households. With regard to energy efficiency, we're already among the best chemical locations in the world. But we're constantly raising the bar in order to improve. Our solar energy project adds nicely to this goal. Overhead shot panning over several rows of solar panels. Close-up of solar panels zooming out. Wide-angled shot overlooking a small pond in a residential area. Wide-angled shot of an urban area, houses built up on both sides of a road. Back to shot driving past the Moerdijk site. Shot of a Shell employee walking past a network of pipes approaching the camera. Wide-angled view of the site set against blue sky and white clouds. Shot of a Shell employee riding a bicycle on an empty road. Back to overhead shot of the solar panels zooming in. The materials made by the chemical industry play a vital role in our current society and prosperity. That's why we're convinced that in the future, we will play an important part in Dutch society. Side-angled shot of the site. Shot of pedestrians walking on a busy street. Back to series of close-ups of the Shell employees featured at the beginning of the video. Wide-angled view of the Moerdijk site set against blue sky as white smoke rises up out of the chimneys. Fade to white background. General Manager Richard Zwinkles and technology manager Roland Stahlie talk about Shell Moerdijk. Shot rapidly panning over open water. Pan upwards bringing the Shell Moerdijk site into view. A series of hexagons appear onscreen bottom left and right around centred text as displayed below. Rapid shot of the Clamor Shulte vessel docked at Moerdijk. Rapidly panning shot of an employee walking on a walkway of a round structure at Moerdijk. Shot of employees working on scaffolding. Wide-angled shot of Moerdijk. This is where it all began for us in 1968. The start of a new era. After the refinery in Pernis had become too small, Shell decided to purchase a new site. Moerdijk was the perfect choice. Rapidly panning shot over a network of pipes. Shot of a blue entryway signalling lorry entrance set against a blue sky and white clouds. Close-up of an employee welding. Wide-angled shot of the entrance of the site as vehicles drive on various lanes. Upward-facing shot panning over scaffolding. Shot panning across a network of pipes and valves at the site. Wide-angled shot of Moerdijk. Wide-angled overhead shot of the complex pipe network at Moerdijk with Richard Zwinkles walking. Close-up of Richard Zwinkles walking and talking into the camera. Text appears onscreen as displayed below. Hexagons appear onscreen underneath the text. We are a major player in the petrochemical industry worldwide. 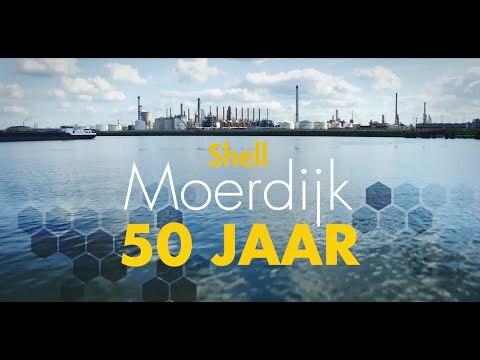 Over the last 50 years, we've seen many successes here at Shell Moerdijk. At the end of the 1960s, we built the naphtha cracker, which produces ethylene and propylene. Aerial, blurry black-and-white footage of Moerdijk. Black-and-white still frame of people on a beach looking on as two individuals in helmets hold onto a piece of rope. Black-and-white footage from when Moerdijk was being built. Black-and-white still frame of two men inside a structure under construction. Black-and-white footage of three men wearing helmets looking at blueprints. Black-and-white footage of men at work. Black-and-white still frame of two men shaking hands whilst posing for the camera. Aerial, blurry black-and-white footage of the construction of Moerdijk. Back to close-up of Richard Zwinkles speaking to off-screen interviewer. Six years later, we added our first MSPO plant where we produce propylene oxide and styrene. We use these to supply the world with, amongst other products, pillows and mattresses on which everyone can sleep in comfort. Low-angled shot of a large pipe, panning upwards bringing into view a row of chimneys set against a white sky. Shot of a van driving past the camera as Moerdijk is reflected in the van’s windows. Back to Richard Zwinkles walking as he continues talking to off-screen interviewer. We produce four million tons of materials annually. The site covers about 250 hectares - the equivalent of 500 football fields. Footage taken from inside a vehicle driving past large round white structures. Wide-angled aerial shots of Moerdijk. Back to Richard Zwinkles walking as he continues talking to off-screen interviewer. There are four large plants, where over 800 Shell employees work together with 500 contractors. This is an amazing company! Shot of a female employee in a white lab coat by a computer looking into the camera. Shot of a woman in Shell clothing and yellow helmet standing by the water at Moerdijk, her arms crossed as she smiles into the camera. Aerial shot of cyclists. Shot of three men in blue jumpsuits standing and looking into the camera. Shot of a man in a dark blue jumpsuit and helmet looking into the camera. Wide-angled shot of two men on scaffolding at Moerdijk. The shot pans outwards several times showing the scale and size of Moerdijk. Rapid shot panning upwards on one of the white chimneys. Rapid panning shot across the complex network of pipes and chimneys. Back to Richard Zwinkles walking as he continues talking to off-screen interviewer. Of course, we work as safely and as responsibly as possible. Shot of four men in dark blue jumpsuits and helmets as one of them holds a notepad. Close-up of the man’s hands as he passes the notepad to the man next to him who then proceeds to write something. Back to Richard Zwinkles walking as he continues talking to off-screen interviewer. Despite our efforts, something did go wrong, resulting in the MSPO-2 explosion in 2014. We learned a lot from this and started an internal improvement programme. Zoom in on still frames of the site after the explosion. Back to Richard Zwinkles walking as he continues talking to off-screen interviewer. Now it's up to Shell Moerdijk to give this programme even more substance in the coming years. I, for one, welcome that challenge. Close-up of a computer screen. Wide-angled view of a man at work on one of many computers in front of him at an interior location. Rapidly panning footage across the Moerdijk site. Shot of three men at work on scaffolding. Back to Richard Zwinkles walking as he continues talking to off-screen interviewer. We are looking forward to a bright future. We've been working on a sustainable environment for years. For starters, we've made our plants more energy-efficient and are researching solutions for our own residual heat and for our neighbours. We are serious about being responsible and we understand the importance of cooperation. Upward-looking shot of a pair of feet on a walkway. Shot of a female worker walking. Upward-looking shot of a network of pipes. Close-up of a blue gloved hand holding a vial. Rapidly panning footage of a female employee in white lab coat walking in a lab. Shot of a man walking through some sliding glass doors as he enters a building. Camera follows the man into an office. Zoom out rapidly to bring into view a white Shell office building by a carpark and large pond with trees at Moerdijk. Wide-angled shot of the site set against a white sky. Close-up of a man wearing protective goggles and a Shell helmet looking downwards. Shot of a man inspecting a cargo train. Shot of two men in Shell clothing talking. Shot of a man on a bicycle. Close-up of Roland Stahlie walking and speaking to off-screen interviewer. 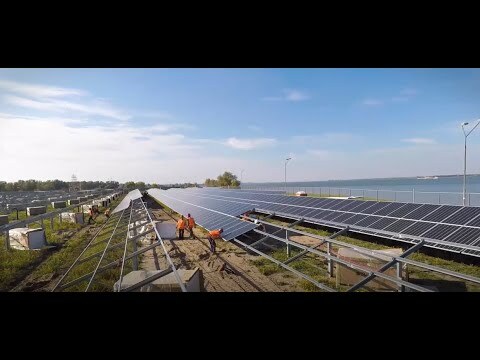 Aerial footage of the new solar park under construction. Shot panning across the solar park infrastructure under construction. Back to shot of Roland Stahlie walking and speaking to off-screen interviewer. Text appears onscreen as displayed below. Hexagons appear onscreen underneath the text. Look! From here to the forest edge, we are building our solar park. We'll have more than 75,000 solar panels supplying 27 megawatts. That's the equivalent of an annual power usage of 9,000 households. Through investments, we're making our plants safer, more efficient, and more sustainable. Close-up of a man speaking on a corded phone. Close-up of a stack of paper. Reverse-angled shot of a man looking at a computer screen. Shot panning left to right of a man in front a long row of double monitors. Shot of four extra-large screens at an interior location displaying different data. Back to shot of Ronald Stahlie walking and talking to off-screen interviewer. Last year, we ran a project that eliminated a major process safety risk. We're currently working on the electrification of one of the plants, which could result in a decrease in CO2 emissions. Wide-angled shot of a man descending some stairs amongst scaffolding. Aerial shot of a JCB forklift driving. Shot of a man on scaffolding looking upwards and speaking into a radio. Close-up of a large green pipe, white tank and valve. Rapidly panning shot of two men in Shell clothing talking. Rapidly panning footage across Moerdijk. Back to shot of Ronald Stahlie walking and talking to off-screen interviewer. With regard to energy efficiency, we're already among the best in the world. Our plants make products that are used in heat insulation and lightweight materials, thus making a relevant contribution to the energy transition. Wide-angled shot zooming out of Moerdijk. Close-up of two men in Shell clothing talking as one of them holds a piece of paper. Shot of two men in blue jumpsuits posing for the camera in front of a lorry. Shot of two men looking into the camera. Teamwork is of great importance to us. Together, we make Shell Moerdijk run smoothly - from our operators in the control rooms, maintenance staff, support services, to our office and contractor colleagues. Shot of a man on the phone at the desk with the double rows of monitors. Series of close-ups of individuals looking into the camera. Shot of a man and woman talking in an office. Shot of a group of men walking past an orange pipe. Aerial shot of cyclists. A clean future is essential for all of us. We're proud that, for over 50 years, we've been making the best products. And we will work hard to pursue an even cleaner future. Low-angled shot of men walking as one of them holds a pair of gloves. Aerial shot of employees walking towards a carpark at Moerdijk. Shot of a man working on a valve. Close-up of a man’s face, then his gloved hand flipping a switch. Close-up of a driver in a lorry. Low-angled shot of a Mercedes lorry driving past the shot. Time-lapse footage of a crane hauling a new chimney into position at the site. Close-up of a gloved hand carrying a piece of equipment. Shot of a safety sign on-site. Footage taken from inside a vehicle driving on-site. Back to shot of the green pipe, white tank and valve. Low-angled shot of a man walking, then pan upwards quickly to reveal steel ropes on a crane. Low-angled shot of a cargo train driving past. Shot of blue signage atop a building reading Shell Chemie. Rapidly panning footage across a walkway amongst pipes. Footage of feet walking on a walkway. Zoom in quickly over a walkway towards two men working on-site. Series of rapidly changing shots of pipes, walkways and valves at Moerdijk. Finally, pan upwards to wide-angled shot of Moerdijk as the sun sets. Omschrijving: Shell heeft een zonnepark op haar eigen chemiecomplex in Moerdijk aangelegd. Het zonnepark zal duurzame stroom aan de fabrieken leveren. Videobeelden van werkers die de panelen installeren. Sinds vijf jaar worden de Koningsspelen in Klundert georganiseerd door MeerMoerdijk (voorheen Moerdijkfit). Shell Moerdijk voert vanaf midden april de komende maanden groot onderhoud uit aan een aantal van de fabrieken. We gaan ze van binnen en buiten inspecteren, schoonmaken en verbeteren. Zo investeren we nog meer in veiligheid en efficiëntie. Veel bedrijven - ook uit uw naaste omgeving - zijn betrokken bij deze grote onderhoudsstop. Shell Moerdijk opent vandaag officieel haar zonnepark. Met 76.000 panelen gaat het om één van de grootste zonneparken in Nederland. Het zonnepark heeft een piekcapaciteit van 27 megawatt. Dit is vergelijkbaar met het jaarlijks elektriciteitsverbruik van ongeveer 9.000 huishoudens. Shell Moerdijk gaat de stroom die dit zonnepark opwekt zelf afnemen. Shell Moerdijk, locatie, veiligheid en milieu, producten en de general manager.